neverhomemaker: Just Call Me Annie Oakley . . .
Just Call Me Annie Oakley . . . 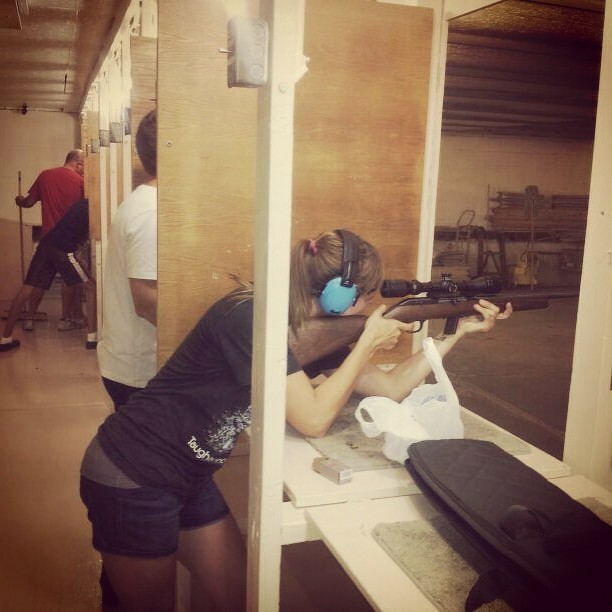 In the spirit of trying new/scary things + turning 30, I shot a gun for the first time last weekend. I'm not joining the NRA anytime soon, but I've always been curious about guns, since I'm -- for all intents and purposes -- staunchly anti-weapons whenever the debate ensues. Weird, I know. I'm not telling this story to stir up anything. It's just about me, myself, and doing something that -- until this weekend -- I never thought I'd do. Some back story. I'm originally from north-central Pennsylvania, deep in the forest. Prime hunting country. No one in my family hunts, though. My dad grew up a country boy and shot his fair share of targets with his father. He has some relics from that time, but only recently decided to take up shooting for sport. Basically, guns were always around . . . I could hear shots in the distance in my backyard when the flatlanders would descend on the town for hunting season. However, they weren't part of my reality. So, fast forward to this weekend. 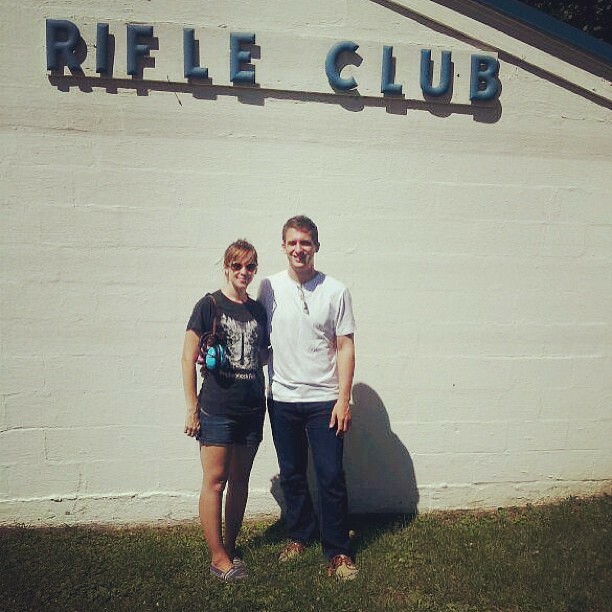 My brother was up visiting from DC and my dad thought it'd be the perfect time to christen his rifle range membership. When we arrived, my mind immediately made sense of the place like some sort of bowling alley. There were lanes, so I guess that's the trigger for that comparison. The piercing sound of bullets nearby shook me from that image -- fast. We slapped on protective glasses, inserted earplugs, and picked up a few paper targets. My dad carefully pulled out his semi-automatic rifle, there's probably some more technical name for it -- I'm not sure -- and got to teaching. We first learned the rules of the range. How the gun couldn't point anywhere but toward the target and various other safety concerns/measures. Then we turned our attention to the gun itself. First and foremost -- where the safety was (which I became obsessed with), then how to load the clip, how to get the bullet ready for shooting, and aiming. I don't know who I was expecting to see there shooting. I admit I came into the place with some preconceived notions. Instead: It was relatively empty, as it was a sunny Saturday afternoon. But there was another father there with his two well-behaved, respectful kids -- a boy and a girl. It was like looking into some time portal mirror. The girl was the older of the two, like me, and they were each probably a good 15 years younger than we are, respectively. Anyway, the actual shooting part of our adventure went pretty fast. We each planned to shoot three rounds of 5 bullets each. My dad started and I was incredibly impressed with his accuracy -- he got several bullseyes right away. Next it was my turn. I was nervous and remember asking several times about how much the gun would kick back. But my first pull of the trigger was honestly quite less frightening/mind-blowing/etc. than I thought it might be. Instead, I grew better with each shot and even enjoyed myself. Don't get me wrong, I'm still terrified by the idea of bullets buzzing nearby. We won't be adding any weapons to our home arsenal anytime soon (of which there's an obligatory baseball bat and a strangely shaped pipe we found in the basement when we moved in.) My thoughts on gun violence have stayed the same. But demystifying how a gun works and learning that some people really do just enjoy it for sport in a controlled environment was eye-opening and, dare I say, empowering? In my last try, I even got a bullseye! I don't really know where this story fits in with my usual blog content. And yet it fits here just perfectly, I think. Have you done anything out of the ordinary lately? My good friend Meg recently went sky-diving and I still marvel at that fact every time I think of it. Thanks for the experience, dad!